Length of Year: artificial counter-rotations set to standard timetables (First Earth Mean Time, then Minbari Standard). Atmosphere: Oxygen/Nitrogen with facilities able to provide alternate atmospheres. Gravity: varies according to distance from the outer hull. At over six miles in length, Babylon 4 was the largest of the Babylon stations and certainly the largest structure ever built by humanity. The Earth Alliance spared no expense in its construction. The station actually survived its completion in 2254 -- unlike the three previous stations. Overseeing the final stages of construction was Major Krantz, who was assigned to that specific duty. 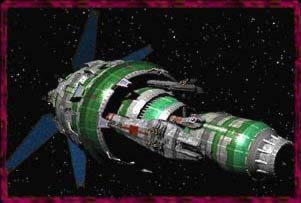 Earthforce was in the process of selecting a commanding officer for the station when Babylon 4 disappeared twenty-four hours after going online. Major Krantz and the skeleton construction crew disappeared with the station. 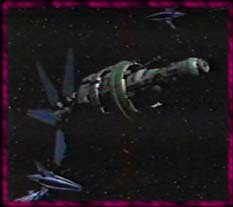 The station reappeared four years later, much to the surprise of the crew of Babylon 5. According to extant records, the trouble began when the sensors were disrupted by a thermonuclear explosion right after the last transport of workers jumped into hyperspace. The remaining skeleton crew were put on alert should the station be boarded by hostiles. Shortly thereafter, the station began to experience discrepancies in their time-tracking systems. The crew, lacking Time Stabilizers, were flung forward and backward in time in what they called "The Flashes." Security teams discovered an alien named Zathras rummaging in one of the station's storerooms. During interrogation, Zathras said that Babylon 4 is being stolen to serve as a base for a massive conflict. He did not act alone, as a space suited individual Zathras called the One appeared several times. Major Krantz was determined to take Zathras off the station, despite his pleas that it would kill him if he entered another timeframe. To Krantz, Zathras was proof of what happened to his station. Luckily for Zathras, he became pinned by a falling support and his "rescuers" had to leave him behind.Babylon 4 disappeared shortly thereafter, but not before evacuating Major Krantz and the skeleton crew. It took ten hours to evacuate the station. Earth Force confiscated all files on the Babylon 4 Incident. Officially, the station was destroyed. The whereabouts of Major Krantz and the 1,300 crewmen are unknown. In 2259, Starfuries patrolling sector 14 reported seeing giant ghost ships, some sightings lasting long enough to get a sensor scan of the ship's emissions trail. Also, a Markab trader travelling through the sector "picked up" a being in his head. It was later returned "home" by Captain Sheridan of Babylon 5. Ivanova, and Captain Sheridan. They arrived in 2254 barely in time to destroy a small Shadow attack force carrying a large fusion bomb -- hoping to destroy Babylon 4 before it is taken into the past. The station's sensors blinded, White Star Prime easily docked on the hull. The station was modified for time travel, while Zathras "ran interference," keeping the Sinclair of 2258 and Major Krantz busy while the others performed their duties. After the last evacuation transport left, so did Babylon 4. The White Star returned to 2260 without Sinclair or Zathras. Those two stayed behind to deliver Babylon 4 to the Minbari in 1257, whose war with the Shadows was going badly. While Babylon 4 succeeded as the new base of operations, it barely survived the war intact, and was placed (in secret) in orbit around Ende X’ton as a monument to the success of the war. One thousand years later (2260 C.E.) the station is discovered as its orbit is in severe decay. An expedition led by Ambassador Delenn recovered several files on Valen before the station was lost forever.